Ok, I'm not sure why this blog is always about food. It's probably because I like to eat and Saigon has a lot of great food. If you want to be healthy, the spa lunch at L'Apothiquare is great. It's a fixed menu with soup, a main course, and a fruit course to finish it off. 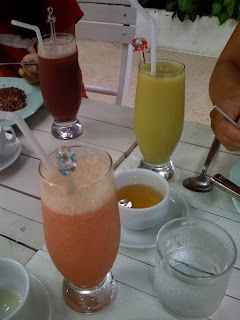 We usually add some fresh fruit juice from their drink menu as well. The menu is different every day, but always good. The chef really knows how to make great healthy food. The seating is outdoors under umbrellas. They have spritzer fans going to combat the warm weather. Unlike many Vietnamese restaurants, they know how to pace the courses. 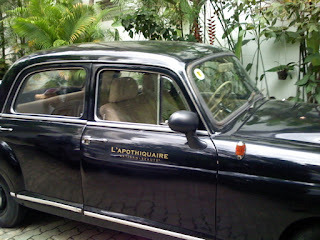 An innovation of L'Apothiquaire is a wireless remote control. When they bring the first course, they also drop off a mini remote. It looks like a small garage door opener. When you've finished the course or need to speak to the server, just push the button. A silent alarm goes off somewhere inside the villa and the server will appear. This is allows you to pace the meal as you like. Very nice! The drawback to this spa is that I can never remember how to spell it so I always have trouble finding the address. On our last visit I took a picture of this vintage Mercedes sitting near the front door as a reminder of how to spell the name. Of course, now it's in my iPhone address book so I'll never have to wonder again. Note L'Apothiquaire has two locations. The one I describe is in District 3, housed in a lovely villa. The other I have not visited and is in a storefront in District 1. I recommend the D3 version. It's a peaceful break from the hectic frenzy of downtown.